Clark (16-1) eked out an 11-7 win over the Bengals in the first round of the Class 4A state tournament to earn a berth in the semifinals, which begin Thursday in Reno. Clark’s boys tennis team mostly rolled through the regular season, winning 13 of 16 matches by six points or more. But the Chargers were tested by Bonanza on Monday afternoon. Clark (16-1) eked out an 11-7 win over the Bengals in the first round of the Class 4A state tournament at Durango to earn a berth in the semifinals, which begin Thursday in Reno. 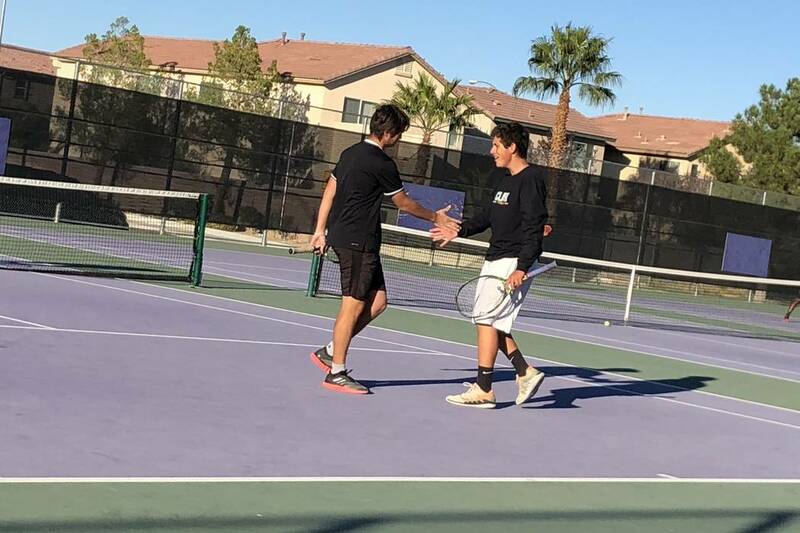 The doubles teams of Simran Shah and Mark Bernales, and Artem Iermolov and Mathew Spagnolo were 3-0 for the Chargers, who will play Reno High for a berth in the title match. Chase Kasday and Blake Kasday each went 3-0 in singles for Bonanza (15-3), which reached the state tournament for the first time since 2008. The teams were tied 3-3 after the first of three six-point rounds and the Chargers led 7-5 after the second. But two Bengals victories in the third round forced Clark to sweat out the last two doubles sets. Shah and Bernales clinched match point. Coronado is set to play Spanish Springs in the other first-round match on Wednesday. Reno and defending state champion Palo Verde round out the field. The Panthers beat the Chargers in the state championship last year and in the Southern Nevada championship match last Saturday. Zimmel said his team is looking forward to the opportunity to play them again this week. “I can see it going either way. It should be interesting,” Zimmel said. “We want to not get ahead of ourselves.